Moving Out And Buying In: Single Ladies Emerge As Homeowners Even though it's tough to purchase your own home in this economy, single women are making it work. After married couples, they're the largest demographic group of homebuyers. In fact, their share of the market is twice that of single men. 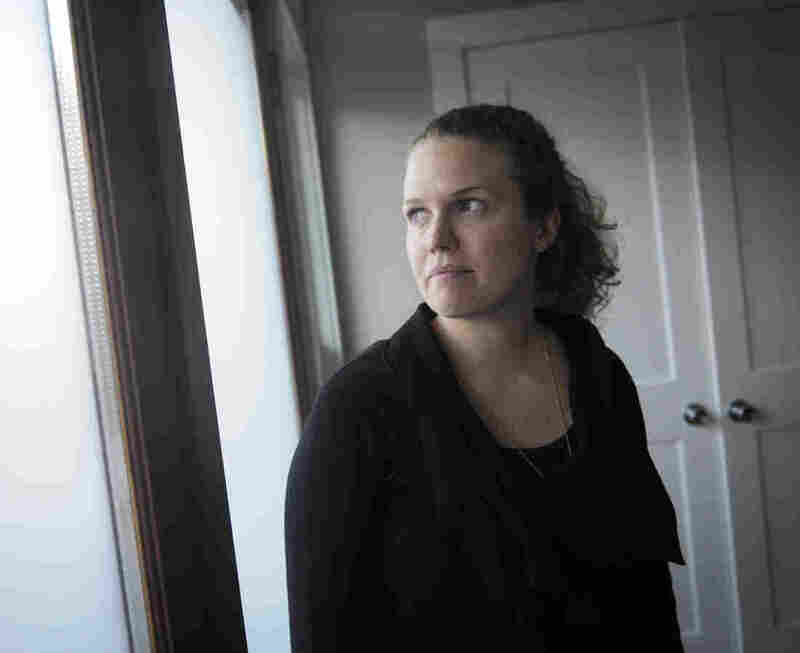 First-time homeowner Amanda Cowley in her new home in the Bloomingdale neighborhood of Washington, D.C. After married couples, single women are the largest demographic group of homebuyers. It's hard to remember that just a few decades ago it was difficult, if not impossible, for a woman alone to take out a mortgage. Federal legislation changed that. And yet, it's still surprising to learn how dominant single women have become in the housing market today: Their share is second only to married couples, and twice that of single men. 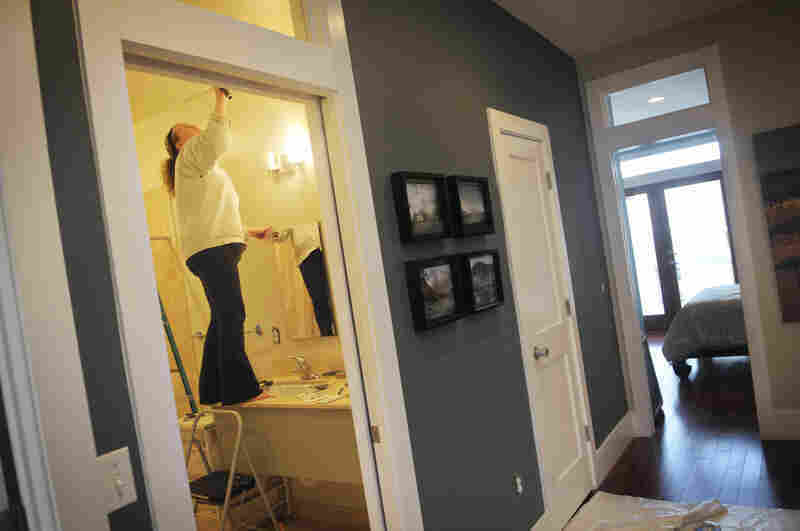 Amanda Cowley repaints her bathroom during renovations made to her new three-bedroom, two-bathroom townhouse. 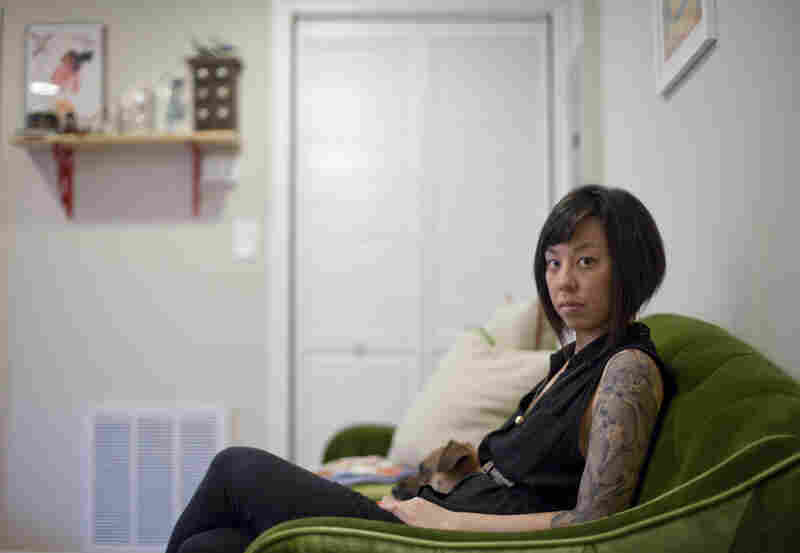 In Washington, D.C., Amanda Cowley lives in her dream home — a century-old rowhouse in a gentrifying part of the city. The 37-year-old and her boisterous dog, Sadie, moved in at the end of last year. The renovated first floor has tall windows and big, open space. Upstairs, there are three bedrooms and two bathrooms. "This is the painting-in-progress piece," Cowley says, gesturing to the paint cans and tarp that line the hall. It's quite a do-it-yourself project. But all this space is a big reason Cowley bought the place. "I wanted to be able to have family come to town and feel comfortable and not be sleeping on my pullout sofa," she says. She's even thinking of getting bunk beds for her two nephews. It's a huge step up from the 800-square-foot condo she bought seven years ago. But by renting out the basement, Cowley's mortgage is actually lower. And it was time for a change. "I realized I was sitting around waiting to get married and move out of my condo," she says. "And then it started to get really depressing to be there for that reason. I was like, 'This was an awesome place to live in when I'm 30, but if I'm still here when I'm 45, it's done.' Like, I'm gonna get 12 cats and give up." Now — besides her one dog — Cowley says there's room for a family, should that happen. Or for her parents to move in, should they need to. "There is room to have the rest of my life in this space that there wasn't in my 800-square-foot condo," she says, "no matter how fabulous a place it was to have cocktail parties." It turns out a lot of women are thinking beyond cocktail parties. Jessica Lautz of the National Association of Realtors says two-thirds of female buyers own single-family homes. "And most of them are three-bedroom, two-bath, great homes," she says. "So it's impressive." In recent years, single women have made up between 16 and 22 percent of homebuyers. Lautz says surveys show they place a higher priority than men on having a place to call their own, and will do more to make it happen. "We asked did they make any sacrifices like cutting spending on entertainment, on luxury items they don't necessarily need, on clothing, even getting a second job," she says. "And consistently, single female buyers are making those sacrifices more than other buyers." Perhaps because, on average, single female buyers earn less than single men, and they're also typically a few years older — but not always. Graphic designer Kaleena Porter sits with her dog, Moby, in the living room of her new home in Northwest D.C.
Graphic designer Kaleena Porter, 26, can still hardly believe she has her own place. It's a garden-level one bedroom, in a different D.C. neighborhood. "I'd never thought about buying," she says. But there was a tenant's dispute in her old building, which forced her out. At first, buying seemed confusing and scary. But she's so glad she did it. "It feels good, actually. It makes a lot more sense," she says. "I feel people shouldn't have to rent, like it should be illegal or something ... your rent money should be going toward some kind of investment." Like Amanda Cowley, Porter's surprised to learn that far more single women than men buy homes — she never would have guessed it. And the statistics, she says, are sad. Her boyfriend rents with two others, and, she says, at first he found the idea of her buying a place "intimidating." But he's come around. Porter says she's changed as well. "All of a sudden here I am owning a house, and having a dog, and being grown up. So it's kind of fun!" she says. With that, it's time to feed her mutt, Moby, and take him for his evening walk. It's a simple, settled routine she's come to love.